President Barack Obama may not have directly threatened to cut aid to Egypt on Thursday, but he made clear that the status quo is no longer acceptable. “While we want to sustain our relationship with Egypt, our traditional cooperation cannot continue as usual when civilians are being killed in the streets and rights are being rolled back,” he said following days of violent clashes. President Obama condemns violence in Egypt but doesn't halt U.S. aid to the country. NBC News' Steve Handelsman reports. But what has that “traditional cooperation” been? Although some U.S. foreign aid has been sent to Egypt since 1946, the current dimensions of the U.S. relationship with Egypt were set by the 1979 peace treaty between Egypt and Israel, which President Jimmy Carter helped negotiate. As Obama and other presidents have said, the continuation of the Egypt-Israel peace accord is an anchor of stability in that volatile region. Of course, oil tankers also transit the Suez Canal. In 2012, more than 3,600 tankers passed through the waterway. According to the U.S. Energy Information Administration, last year nearly 3 million barrels per day of total oil transported in both directions. “This is the highest amount ever shipped through the Suez Canal and made up about 7 percent of total seaborne-traded oil,” the EIA said. Oil shipments also rely on the 200-mile Sumed pipeline, which runs across Egypt, connecting the Gulf of Suez to the Mediterranean Sea. Saudi Arabia, Kuwait and other Persian Gulf oil producers move more than three-quarters of their oil exports to Europe by way of the Sumed pipeline. As of last December there were about 300 U.S. military personnel stationed in Egypt. 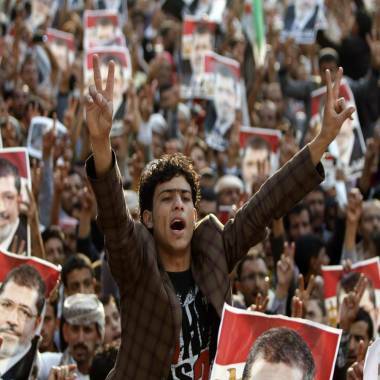 Supporters of deposed Egyptian President Mohamed Mursi shout slogans during a march to show solidarity with his supporters in Sanaa, Egypt, August 15, 2013. Then there is the U.S. money that goes to Egypt. Between 1948 and 2011, the United States provided Egypt with a total of $71.6 billion in aid. Egypt is the fifth-biggest recipient of U.S. foreign aid, after Israel, Afghanistan, Pakistan and Iraq. For the fiscal year that begins Oct. 1, Obama has requested $1.55 billion in aid to Egypt, $1.3 billion in military aid and $250 million in economic aid. The military aid takes two forms: Foreign Military Financing (FMF) and International Military Education and Training (IMET). In FY2011, Egypt received almost a quarter of all U.S. FMF funds. The FMF money is used by the Cairo government to buy weapons, aircraft, and other military hardware from U.S. companies. The money can also be used for modernizing already purchased equipment and to pay for maintenance. According to the CRS, “U.S.-Egyptian coproduction of the M1A1 Abrams Battle tank, which began in 1988, is one of the cornerstones of U.S. military assistance to Egypt. Egypt plans to acquire a total of 1,200 tanks. Under the terms of the program, a percentage of the tank’s components are manufactured in Egypt at a facility on the outskirts of Cairo and the remaining parts are produced in the United States and then shipped to Egypt for final assembly.” General Dynamics is the prime contractor for the tank program. Lockheed Martin is also a major player in U.S.-Egypt military relations. According to CRS, in 2010 Lockheed Martin and Egypt reached an agreement for the purchase of 20 F-16s, worth an estimated $2.5 billion. CRS estimates that U.S. military aid covers as much as 80 percent of the Egyptian Defense Ministry’s weapons purchases. The United States also offers IMET training to Egyptian officers partly to instill professional military values and habits into the Egyptian officer corps and to make U.S.-Egyptian military cooperation work more smoothly. General Abdel Fattah al-Sisi, Egypt's de facto leader and defense minister, graduated from the U.S. Army War College in Pennsylvania. U.S. military schools train between 500 and 1,000 Egyptian officers every year.